In one of my classes this semester I have studied in detail the story of the Annunciation, especially in St. Luke’s account. My teacher Fr. Miller described this as Mary’s “vocation story.” This familiar Gospel passage shows St. Gabriel the Archangel greeting Mary and asking her to be the mother of Jesus, the Messiah. We have learned that Gabriel is telling Mary to rejoice for God’s incredible plan for her life and for the life of the future Holy Family. 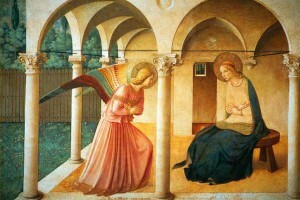 In this dramatic scene, Mary ends her dialogue with Gabriel saying “Let it be unto me according to your word” (Lk 1:38). Mary gives her yes to God’s will, out of love, consenting to let God intervene in a most extraordinary way in her own life. God has tremendous plans for our lives that He has known since time began. It’s quite remarkable and we cannot fully grasp this in our time on earth. Listen how comforting these Scripture quotes are from a couple of Old Testament prophets: “For surely I know the plans I have for you, says the LORD, plans for your welfare and not for harm, to give you a future with hope” (Jer 29:11) and “Yet I will not forget you. See, I have inscribed you on the palms of my hands” (Is 49:15-16). God knows us better than anyone else in the world, and he has made us to be here at this very moment and prepared all of us for a special purpose. Perhaps God is calling you in a special way, calling you to enter the seminary to discern a call to the priesthood. If so, can we trust God enough to give up our own wishes and plans to listen to his? It is easy to think we are unworthy anything large God has planned in our lives. In addition, it is often hard to commit to something for a long period of time, without knowing exactly what’s in store for us. However, God will never give us a task too great. We too are called like Mary was to say yes to God. We do this because God loves us, we love him back, and we entrust ourselves to his sheltering care. In our case, it may be a yes to entering the seminary, yes to God’s desire that desires that you become a priest. At the end of the Annunciation account, Mary joyfully abandons herself to God’s will and says yes. Her yes changed the face of the earth as she bore Jesus Christ, the King of Kings, our Savior! Will you do the same and watch how God will use your yes to manifest great things in the world? Peter Gallagher attends The Pontifical North American College in Rome, Italy.